As more and more locals opt for post frame building, it leaves other Adrian locals scratching their heads – why the sudden popularity and what is it exactly? Wise residential and commercial property owners are always seeking out ways to make better use of their property, while also increasing the value. So if you are not yet convinced this type of structure could be right for certain options on your property, it is time to find out more. Simply put, post frame building relies on a wood-frame system made up of widely spaced support columns. These large columns are most commonly used for constructing things like barns, sheds and storage. But what makes them such a great choice? For one thing, this is a much more cost-effective alternative for building. If your project has a limited budget, you will be amazed at how well you can make it work for you, by opting for this building approach. They are also quicker and easier to assemble, making them perfect for projects on a time crunch. Of course, having the ability to put them together easier and quicker is also part of what makes this approach more cost-effective. It’s a win-win. Don’t worry though, being quick and easy does not mean you are sacrificing strength and durability. You still get exceptional strength and durability, as well as retain much more design flexibility than you would imagine. The columns reach all the way into the ground, and the horizontal girts that connect them are engineered to withstand more than a fair share of snow or wind load. This project, and the end result, are considered energy-efficient, which is important now more than ever. Enhanced energy efficiency means you conserve energy which costs you less each month in utilities, but it also makes your project more environmentally responsible. Omni Builders has been helping locals get the service that they need and the results that they deserve, for over 20 years now. Whether you already know that you would like to opt for a post frame structure, or need to find out more, we are here to help. Don’t settle for less than the best, when it comes to the work that goes into your project, be it residential or commercial. 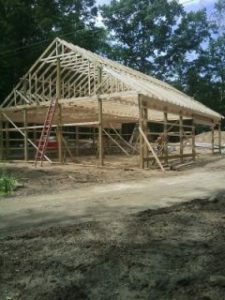 If you are looking for a Pole Barn Builder Company in the Adrian area, please call Omni Builders at 517-486-3784 or fill out our online request form.